The origin and significance of the wedding ring is much disputed. One school of thought maintains that the modern ring is symbolic of the fetters used by barbarians to tether a bride to her captor’s home. If that be true, today’s double ring ceremonies fittingly express the newfound equality of the sexes. The other school of thought focuses on the first actual bands exchanged in a marriage ceremony. A finger ring was first used in the Third Dynasty of the Old Kingdom of Egypt, around 2800 B.C. To the Egyptians, a circle, having no beginning or end, signified eternity—for which marriage was binding. 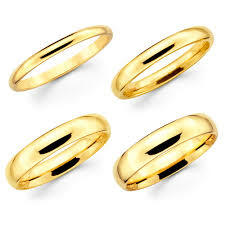 Rings of gold were the most highly valued by wealthy Egyptians, and later Romans. Among numerous two-thousand-year-old rings unearthed at the site of Pompeii is one of a unique design that would become popular throughout Europe centuries later, and in America during the Flower Child era of the ’60s and ’70s. That extant gold marriage ring (of the type now called a friendship ring) has two carved hands clasped in a handshake. miniature key welded to one side. Not that the key sentimentally suggested a bride had unlocked her husband’s heart. Rather, in accordance with Roman law, it symbolised a central tenet of the marriage contract: that a wife was entitled to half her husband’s wealth, and that she could, at will, help herself to a bag of grain, a roll of linen, or whatever rested in his storehouse. Previous PostKing of the colons…..
Next PostA very short history of Birthdays…….